You don’t get those spicy dumplings or crisp dosas from the street corner when you shift to a Western country. But the weather certainly is better. These two points are obviously not the only things that change when an entrepreneur moves from an Asian country to a western one. Transitions aren’t easy, be it in personal or professional life. It is certainly a task to unlearn things and pick only the best that can fit into the new life. Most humans follow a routine, stick to it and only change it when a severe need arises. I will be little more truthful, people in general, try to avoid changes. What makes entrepreneurs special is, they are that unique kind who adapt to changes pretty fast. They are in the game for long and understand why changes are the only thing that is permanent. Economies are changing fast while globalization is playing its role in the background. In this ever competitive world, it has become very important for entrepreneurs and businesses to put only their best feet forward. Entrepreneurs are changing bases for various reasons today. Be it to be nearer to their target customers or because of the taxation policies in their home country. I know a couple of a couple of entrepreneurs who have taken the risk only to see a broader richer perspective. Whatever the reason, things change drastically for entrepreneurs when they shift. This particular article is about the shift from Asian countries to western countries. I chose these 2 parts mostly because the cultural, social aspects are very different. 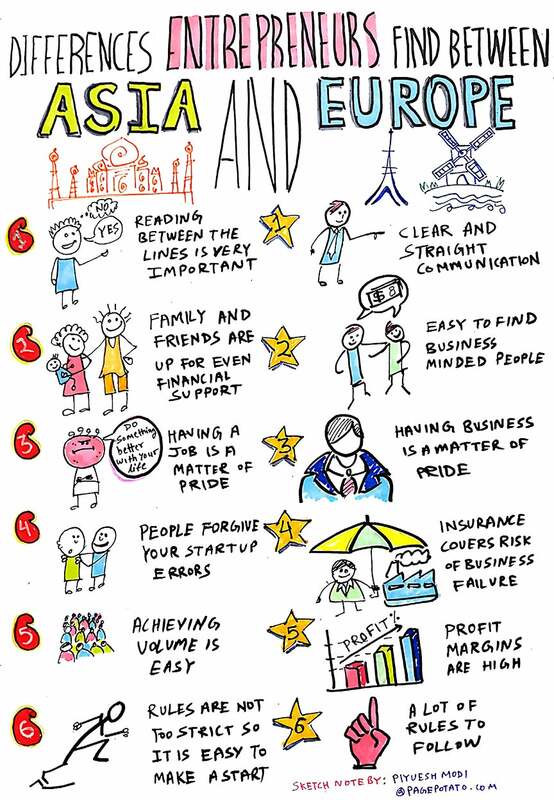 These social and cultural aspects further lead to different business behaviors and habits. Here are 12 things that majorly change for entrepreneurs after their shift. Some of them are great while some others aren’t so encouraging. It is certainly the entrepreneur’s call to decide what tops his/her priority and what could just be worked with. People in Asian subcontinent are sweet talkers, they discuss issues indirectly. Mostly when they sense there are chances of conflict. They certainly intend well but give space to a lot of unnecessary chatter or fillers. If you are someone who is not very good at holding conversations that are long, this shift will do you good. Westerners are direct people and don’t encourage fillers or any conversation that is not directly linked to the issue. People in western countries are very focused and business minded. Their understanding of business is pretty definite and leaves less scope for the disparity. Whereas their Asian counterparts can be a bit judgmental or skeptical about new ventures. Western residents are known to be big risk takers and a curious lot, they encourage ventures that have potential. Having a business of your own in any Asian country must not have been too fine with people around you. But Western residents are highly enthusiastic about ventures that are bringing in good changes. Chances of you being funded or supported are higher if you have an idea that touches the right chords. Businesses are seen in a very different light in Western countries, unlike Asian countries where it is seen majorly as a risk. Businesses for entrepreneurs come with the scare of failure and hope of success. It’s easier to safeguard yourself in case of such unseen circumstances in Western countries. The insurance coverage gives better security than in Asian countries. The exchange rates are pretty favorable in western countries. There could be many other aspects of finance and taxation rules that can credit to better margins in western countries. Western countries are very thorough with their rules and regulations. They have pretty well researched and systematic flawless procedures that are easy to follow. Asian countries can have very stingy procedures that are hard to follow. Things are not very coordinated and well-worked out when it comes to offices or procedures in Asian countries. The standard of living, in general, is pretty high in western countries. Be it your rent, manpower or registrations, they will all be costly than their Asian counterparts. Businesses function differently in different parts of the world. It could be basic etiquettes or major conversations, but they impact businesses. Something as simple as the pitch of your voice can bother a Western work acquaintance and will not bother an Asian at all. Western residents are very particular about certain things, that might not hold any value in Asia and Vice-Versa. If you are someone who has stayed in an Asian country for too long, you know the affinity to conversations. While doing business in western countries it is important to not drag conversations. They are open to criticism and won’t step back in pointing your mistakes. It’s a new country and people in western countries are more self-involved, unlike Asians who are community beings. Creating a new network of the right set of people can become a major issue in western countries. They won’t sugarcoat words to keep your heart but will be genuine once you create the connection. It will certainly be difficult compared to Asian countries but is absolutely doable if you are confident. Western residents will greet every stranger on the street, but they won’t necessarily trust you. It will take more time to bring the same kind of trust you had to in Asian countries. Trust in the quality of your products/services will be doubted initially until you have made a steady local base. Most western residents are fluent in English and mostly everyone can understand and communicate the basic. But aspects like form filling and taxation could be an issue in certain countries, that have them in their local language. The decision to shift might be difficult, but you will eventually decide what’s best. Besides, your strength to adapt is what makes you what you are today. Be honest with yourself about your priorities and make use of these points to take a feasible decision.